You want to travel the world. It is the wish of most Indians (as per IMRB), a wish second only to owning a home. And you want to travel the world at low cost. Or even FREE! This is where Travel Hacking comes in. Travel Hacking is the art and science of scoring travel deals. You can enjoy low cost (and sometimes free) international travel by various methods which include earning airline frequent flyer miles and hotel loyalty points to bag those airline tickets and / or hotel stays. You already knew that you can earn these miles and points by flying more with your favourite airline or by enjoying the hospitality of your favourite hotel chain. But, what if you could earn these miles and points without flying and staying??!! Travel Hacking also involves being smart while searching and comparing tickets and rooms for your next holiday. Which frequent flyer program/s should you join? Why? When should you buy an air ticket to minimize cost? Which airline? How? How can you save money on attractions and tours? Save Money. 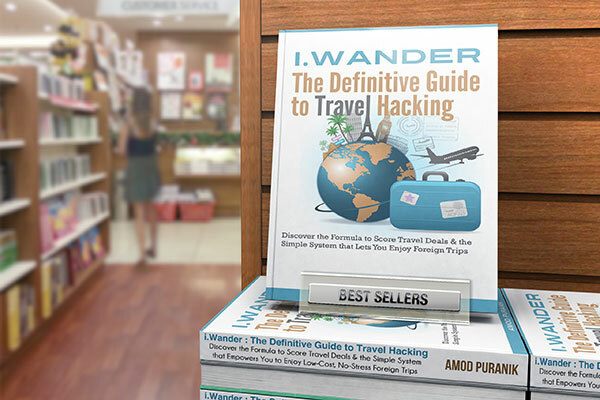 i.Wander will enable you to save money instantly, right from its first chapter. As you implement the methods, you will accrue more savings. You want a ballpark figure, you say? How about a minimum of Rs. 10,000 on ONE trip per person. Now, multiply that with the number of members in your family / group and by the number of trips you will take and suddenly the savings will be enormous! So, for an investment of Rs. 149, you are getting returns of more than hundreds or thousand times. So which guide will save you that much? Save Time. I have written this guide based on own experience and after reading, analysing and making sense of almost 100+ travel blogs and forums online as well as books. The result is a distilled ebook without the padding. Why am I Qualified to Write this eBook? I am a military guy, engineer and an avid traveller – which implies that the military has given me the skills & discipline for planning our travels, the engineering has given me the rational, calculating brain, while travelling across the nation and the globe has given me the experience and practical knowledge of travel. Did I mention that my father was in the airline industry? Why is the eBook costing Rs. 149 when lot of the info is available on the Internet for free? Okay, sure. First up, about 40% of the stuff is available on the Internet for free. You will need to look up hundreds of travel and lifestyle related websites, blogs and forums, read up on various airline and hotel material to get that 60%. Moreover, lot of that info is for the US. What I have done is researched the material off the Internet, some offline sources and collate them in a clutter-free, coherent, easy to understand eBook tailored for us in India. And I have added our own travel experiences to get you first hand information. You will also get to download the Excel files for planning and documenting your trip. TripWiz.in uses a secure payment processor – Instamojo. On clicking the button for purchase, you will be taken to Instamojo.com to complete your payment. On payment completion, you will be redirected to download the eBook. You will also receive an email with the confirmation of payment. Can I share this eBook? It means you liked the eBook – thank you so much for the compliment! But, can I request you NOT to share the eBook file per se. I will really appreciate it if you share this website on your Facebook, Twitter or email to your friends and relatives.